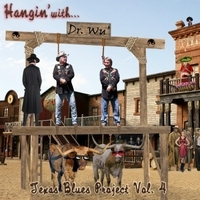 This is Volume 4 of Dr. Wu's TEXAS BLUES PROJECT... a project that was started in 2007 by JIM ASHWORTH and BRYAN FREEZE (a.k.a. Dr. Wu') ... originally conceived to spotlight top artists from the Fort Worth, Texas area... and to write, produce and record the very "Best Texas Blues" available. As the Project progressed, it became obvious that the winning studio combination was to team up with Texas Bluesman... BUDDY WHITTINGTON... along with his band members... Mouse Mayes, Wayne Six, and Mike Gage. Other top session musicians include... Red Young on the B-3 Organ, Gary Grammer on harmonica, and more recently the Walker Effect on back up vocals...featuring Yolanda Walker on solos. Vol. 4 of the Texas Blues Project: Should be in every music collection! Bryan Freeze and Jim Ashworth aka Dr. Wu' worked very, very hard to top the winning combination of the "Live From Texas" CD/DVD from 2012 and the result is an album that could stand as ptototype for the "Texas Blues Rock" genre. Again Buddy Whittington and his US band are part of the game and that's Wayne Six on the bass, Mike Gage on the drums and Michael "Mouse" Mayes on guitar. New is that "Mouse" sings lead on a few tunes and he enriches the sound of Dr. Wu'. Just hear the hendrixish "Voodoo Doll" or the first track "Need A Witness". He isn't only a fantastic guitar player he can really sing! Yolanda Walker who sang background on a song of an earlier volume now has a bigger role on the microphone and brought her Family "The Walker Effect" with her. Fantastic! Everybody who loves the blues with fantastic guitars by Jim, Bryan, Buddy and "Mouse" will be happy with this album. Great singing overall and musicians who really know what they are doin'. And it is not only guitars and vocals. Have a listen to Red Young the B-3 Hammond player. Unbelievable good! Normally I don't like artists who claim always that their recent album is "the best I have done in my life" but "Hangin with Dr. Wu' is such an recording. Really!